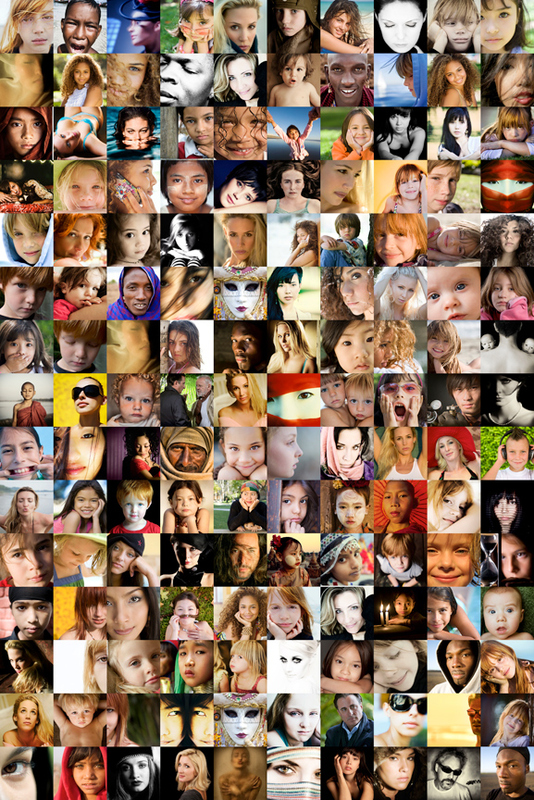 I wanted to show a fun way to display many of your photographs in one image and end up with a very beautiful collage. Making a collage of your images can be pretty addicting after you have realized how easy it can be. I want to show you a cool little piece of software that will let you design your own collages and in whatever size and shape you want, using as many images as you would like. I have tried all kinds of different software for making collages and I have to tell you that the best software in my opinion to do this is called Posterino, http://zykloid.com/posterino and it is made by a company called Zykloid Software, which is based in Germany. Their software also gives you the ability to make calendars, custom postcards, posters, photo frames or even contact sheets. They have an amazing amount of templates that are just gorgeous and playing around with the customizable templates really is addicting and incredibly fun. I have always liked beautiful collages and sometimes you might have a large amount of images from a particular trip that you took or from any other photography work that you have done. Being able to display them all in one image can actually be pretty beneficial and also pretty stunning to look at by others. Even making a custom calendar with different images can be a great present for someone and the sky really is the limit with working with this program. I just love great software and also love letting everyone know how beneficial some of this software can be. With Posterino, I really like their interface and menus with so many different options and I think the price is right also at $29.95. They really have done it right and once you try your own collage, I guarantee you will also be addicted like I am! In the first image above, I decided to make one that included many of my favorite portraits that I have created through the years from all over the world. 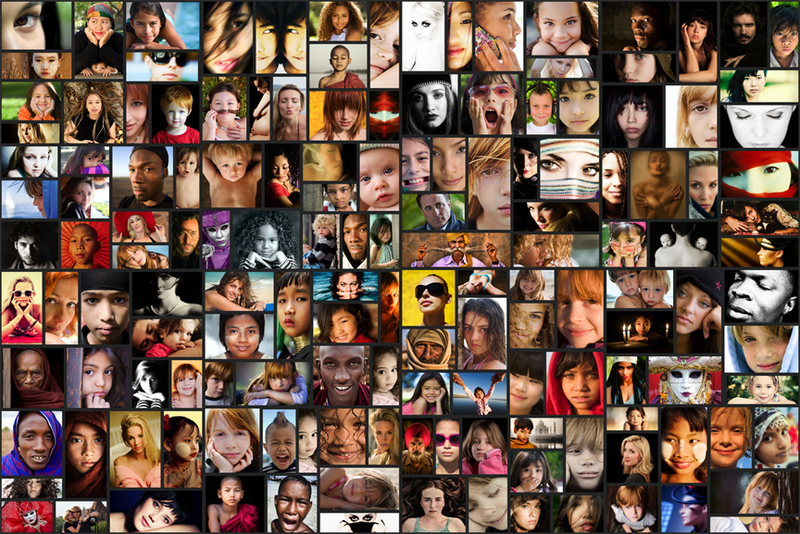 Many of the images are ones I show in my class that I teach online at PPSOP, Eye to Eye: Capturing the Face, and I thought a giant collage would make a pretty powerful poster and Posterino did not let me down. I decided to use one of the random templates that mixes up all of your images in different sizes all throughout the collage. Below is a screenshot of the interface and after you have picked out a template that you want to use, it lets you import images one at a time or use a folder to import them all at once. You can redesign the template at any time while working on your collage and also move around your images anywhere in the collage that you want. If you want to move one image from one place to another, it will let you move it to a spot where another image is and then take that image and move it to the old spot. You have to use this software to understand how amazing it really is it just works! 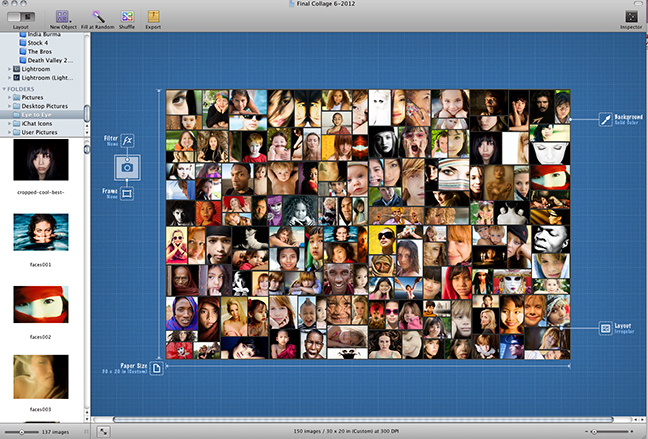 You can also double click on an image and resize it or move it to get it just right in the collage. You do not have to just let it stay the way it looks when imported….you can move it or make it just the way you want!! This is where you really can make your collage absolutely perfect! Below is another variation I did but used another template where all of the images were the same size and much more uniform. I also decided to have no border around the images with no background color. The images are still randomly placed but the sizes are all the same and I chose a square box for each image and many times this is very powerful for a collage. You can also decide on the final dimensions of your image making it either horizontal or vertical or even square, which is definitely one of my favorites for sure. Inside the program, you have many options as it is incredibly interactive and you can change the widths of the lines that border each photo or even decide to have no lines whatsoever, add effects to the images or frames, change the background color and so many other things also. The sky really is the limit and once you decide to make your first collage, you will probably spend a lot of time tweaking everything to get it just perfect. The image below is one I did in vertical format but shows a different template that overlaps the images and I made a fun collage that is a lot different than the one above. 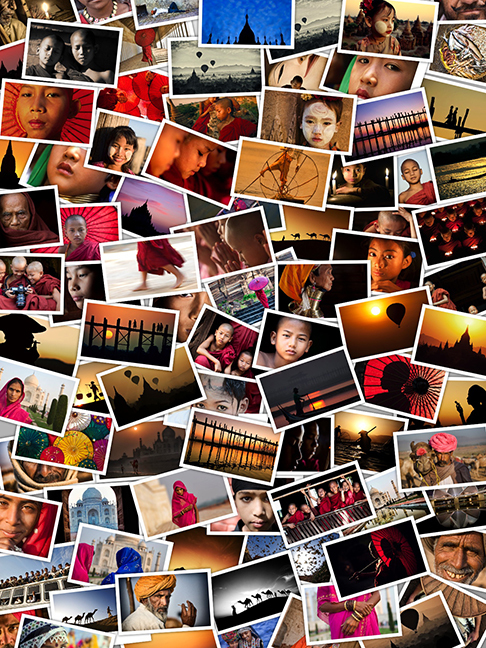 I used many images from India and from Burma where I do workshops and I love how easy it was to just drag and drop a folder of images and instantly get a cool looking collage. One of the best parts of Posterino is a button that you can push on the interface and it randomly moves all of your images to another location. It is absolutely incredible and gives you a different look and feel every time you click the button. 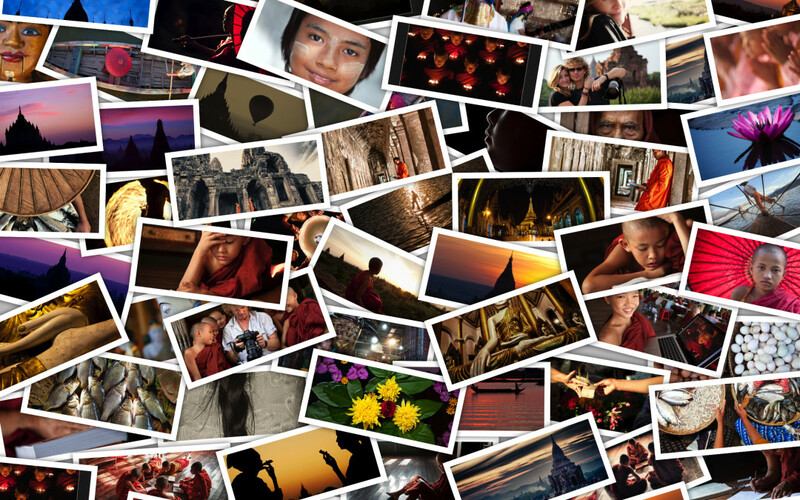 Your collage can look one way one second and then at the click of the button, have a totally different look and feel. This part is really addicting and I guarantee that anyone using this software will have a pretty good time and come away with a good-looking collage for sure! I love photography more than anything in the world and it’s great to find new ways to display your images. Having the ability to make a print, calendar or even a poster of many of your images, the way that this software lets you do it, is just fantastic and anything that helps us as photographers is a good thing. We have all seen collages in many shapes and forms all over the place but this software is incredibly easy-to-use and gives all of us the ability to create something gorgeous in a matter of minutes. You can download a trial version and play with it without having to buy it but it does place a big watermark over your image. The price is actually pretty nice for what you get and I hope some of you try this cool program out as I bet you create some pretty stunning collages!! We want to request your permission to reproduce the image “Final-collage-6-20121” in the cover of an academic book on abortion. (Universidad Diego Portales, Santiago de Chile). We look forward to your response, Thank you. and a little more info on the book? thank you! Dear Scott!! you are the best!! this tool as well as others is super cool and supper affordable! thanks for all you share with us (students) its so evident that you care for all of us like few teachers do! Shooting after dark: It’s all about the light! Clothes & Props Can Make a BIG Difference in Your Portraits! Passage to Burma, my new book is out!! !